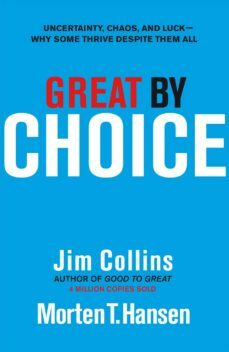 THE NEW QUESTIONTen years after the worldwide bestseller Good to Great, Jim Collins returns with another groundbreaking work, this time to ask: Why do some companies thrive in uncertainty, even chaos, and others do not? Based on nine years of research, buttressed by rigorous analysis and infused with engaging stories, Collins and his colleague, Morten Hansen, enumerate the principles for building a truly great enterprise in unpredictable, tumultuous, and fast-moving times.THE NEW STUDY Greatby Choice distinguishes itself from Collinss prior work by its focus not just on performance, but also on the type of unstable environments faced by leaders today. With a team of more than twenty researchers, Collins and Hansen studied companies that rose to greatness - beating their industry indexes by a minimum of ten times over fifteen years - in environments characterized by big forces and rapid shifts that leaders could not predict or control. The research team then contrasted these "10X companies" to a carefully selected set of comparison companies that failed to achieve greatness in similarly extreme environments.THE NEW FINDINGSThe study results were full of provocative surprises. Such as: * The best leaders were not more risk taking, more visionary, and more creative than the comparisons; they were more disciplined, more empirical, and more paranoid. * Innovation by itself turns out not to be the trump card in a chaotic and uncertain world; more important is the ability to scale innovation, to blend creativity with discipline. * Following the belief that leading in a "fast world" always requires "fast decisions" and "fast action" is a good way to get killed. * The great companies changed less in reaction to a radically changing world than the comparison companies.The authors challenge conventional wisdom with thought-provoking, sticky, and supremely practical concepts. They include 10Xers; the 20 Mile March; Fire Bullets then Cannonballs; Leading above the Death Line; Zoom Out, Then Zoom In; and the SMaC Recipe. Finally, in the last chapter, Collins and Hansen present their most provocative and original analysis: defining, quantifying, and studying the role of luck. The great companies and the leaders who built them were not luckier than the comparisons, but they did get a higher Return on Luck. This book is classic Collins: contrarian, data driven, and uplifting. He and Hansen show convincingly that, even in a chaotic and uncertain world, greatness happens by choice, not by chance.